Off the far tip of Cornwall, beyond Land's End, lie the Isles of Scilly, and on some of the islands live the famous Scilly shrews. In the equally famous Abbey Gardens on Tresco there is a big shed where we humans have put figureheads from off our ships. Well, behind that shed, somewhere in the long grass, is a nest containing one particular family of shrews. There's Mum, Hepzibah, her three little boy shrews, Gimble, Gweal and Kettle, and her two little girl shrews, Tamsin and Flossie. The shrews have lots of bird friends - particularly one named Fluff the Chough - and another of their special friends is a frog named Percy. You may think the life of a shrew is not very interesting, but you couldn't be more wrong. Contained in this book are just a few of the many stories about things that have happened to our little family of Scilly shrews - both their adventures and their misadventures - and I hope you enjoy reading them. Should you ever find yourself on a beach on Tresco, perhaps you will be lucky enough to see a Scilly shrew, or two, or three, or maybe even four! A book written for all generations by a talented author, about the exploits of a family of shrews on the magical Isles of Scilly. The five children each having their own individual characters that you can associate with as they enjoy living and playing with their various island friends. Their adventures depicting the family traditions, layers of the island’s history, smugglers, the beautiful crystal blue seas, caves, sandy beaches, the curious plant life and seasonal weather. A very entertaining read with associated illustrations, which allows you to be transported away and visualise the stories in your imagination. I look forward to future tales of the shrews who love to twitch their noses in excitement and agreement. 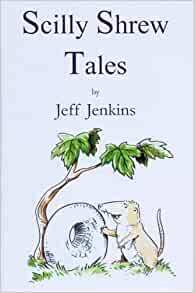 The tales of five young Scilly shrews and their friends are easy to read and fun. The book is also very nicely illustrated. 5.0 out of 5 starsJust Lovely! I love this book - so well written for young readers! A collection of amusing, gentle stories about a cute Shrew family. Each chapter is a different story just long enough to keep kids entertained and enthralled. I got this for my daughter and it was fabulous for encouraging home reading, but I would especially recommend grandparents out there buying it to read to, or with, your little one - timeless tales (or tails!) for all. Very entertaining. A charming book full of shrew adventures. Nice short chapters - we read one a night. A book for adults and children alike.